We’re hosting an installation of 1,000 linocuts for two days in November to help raise money for Autism East Midlands and The Woodland Trust. 1,000 Native British Trees is an exhibition staged by Nottingham based artist Tristram Aver. Using lo-fi, environmentally friendly printmaking techniques (linocut on recycled / recyclable British paper from coffee cups), Aver will produce 1,000 images of his Native British Trees in one day; the same number of trees that a professional planter can plant in a single day. 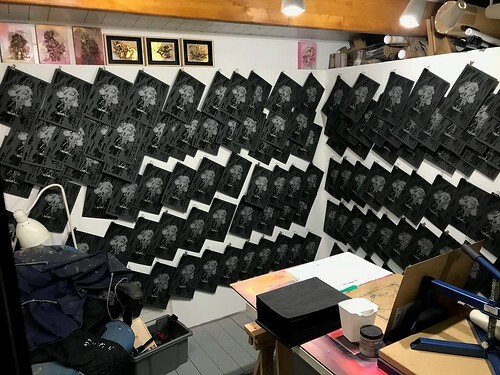 Prints of Aver’s tree ‘explosions’ will be overlaid to create rows of tree-like silhouettes and canopies, in reference to the destructive impact humans have made on the natural world. The images will be displayed as an installation in the LPW Exhibition Space over the weekend of Saturday 3rd and Sunday 4th November in advance of National Tree Week (24 Nov – 2 Dec). The work will be for sale (£10 per print) in aid of Autism East Midlands and The Woodland Trust. The exhibition is part of Julie’s Bicycle’s Season for Change programme.